Egypt’s Ministry of Trade and Industry released its Local Industry Development Strategy (LIDS) earlier this month, a national programme for growth in line with its existing Sustainable Development Strategy. The two strategies aim to raise industrial growth to 10 per cent annually by 2030 and to increase the local components used in production. The LIDS will make available support for local industries to enable them to compete with foreign counterparts. During the first phase, the LIDS will focus on the engineering, chemicals and building materials industries, being three of the largest industrial sectors. According to government officials, approximately 25% to 30% of building materials are locally produced. If this sector is developed, the figure will rise to 70% within five years. Consequently, the LIDS should focus on manufacturing the components that Egypt currently imports. The strategy should also target each industrial sector individually to identify which components should be locally manufactured. A review of the structure of Egypt’s imports during the first half of this year had revealed that 55 per cent were in the engineering, chemicals and building materials sectors. Developing the industrial sector should be based on increasing the production of intermediate goods and decreasing the imports of production inputs, such as ceramics and marble. 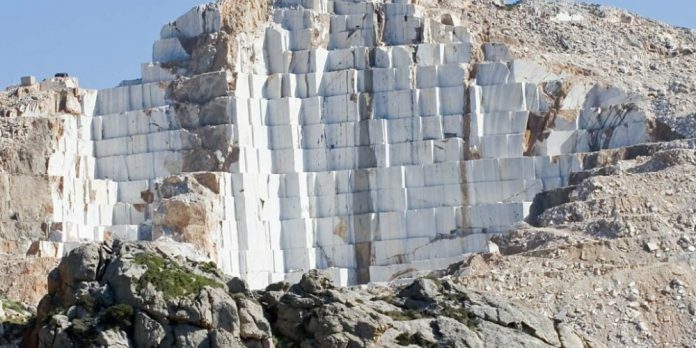 Stonenews.eu, after studying the statistic reports of the International Trade Centre and the National Statistical Institutes, is presenting Egypt’s marble imports in 2017. In 2017, Egypt’s imports reached 38,23 million US dollars in total. 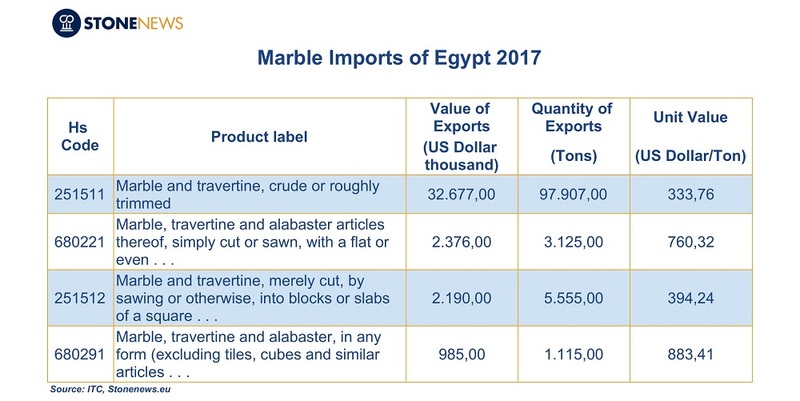 The table below shows the export value, the quantity and the price per tonne of Egypt’s marble imports in each HS Code related. As shown at the table, Egypt imports mostly raw marble blocks and slabs and specifically products related to HS Code 251511* with total value of almost 32,68 million US dollars and to HS Code 251512* with total value of almost 2,19 million US dollars . Finished marble products under HS Code 680221* and HS Code 680291* reached total value of almost 2,38 million and 985.000 US dollars, relatively. Egypt’s imports of raw marble blocks and slabs under HS Code 251511 come mainly from Turkey (40,1%), with Italy coming second (32,8%) and Spain third (17,4%), while raw marble products under HS Code 251512 are mainly originated from India (42%), with Turkey (27,4%), China (13%) and Italy (9,2%) in second, third and fourth place relatively. India remains the leading supplier of finished marble products as well, and more specifically of products under HS Code 680221 with 36%. China comes second with 30,1%, followed by Portugal (14,9%) and Spain (9,9%). As for finished marble products under HS Code 680291, Italy holds the lead with 28%, followed by Greece with 21,4%, leaving Turkey (18,5%) and China (14,7%) behind.